I'm 55, female, a little over weight, and I smoke.... a lot. Other then that I'm in VERY good health. Even in high school I couldn't run around the track. But, I have always wanted to run, to be a runner. If I stop smoking again... is it possible for me to start running? When I have tried in the past the front of my legs killed me for days. My shins I think they are called. If you are in good health, there is no reason that you can't start running. Not knowing how much you actually smoke(d), how active you have been over the past years etc., I can't be careful enough and do have to advise you to consult your physician to advise him/her about your exercise plans and to ask for his/her advice. As a new runner, probably not having exercised enough in the past, you will find that the beginning is tough. Your legs will protest. Muscles that you did not know existed, will hurt. My main advice to beginning runners is to take it easy. Start off with easy paced running. The pace at which you are able to maintain a conversation. 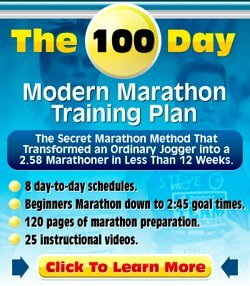 Do a run/walk program that eases you into becoming a runner. "I just finished your Beginning Running Program 3 and loved it! I went from being able to not even run to my mailbox (2 blocks away) to running a 5k in just over 30 minutes. When I looked at what was required in days ahead it seemed daunting, but by the time I got there I was always able to accomplish the workout. I am running my first 5k race in two weeks and just bought a heart rate monitor to start the 10k running program. I am really excited to continue running. Thank you for all the information and time you have put into your programs and your website. There is a runner in all of us, waiting to get out! Have a look at my beginner running tips for more advice to beginning runners and at my beginner running programs. I hope there is a running program there which is right for you!